Our Cotton Protective Jacket it is made from quality cotton/polyester. The hat comes with a secure elastic strap for under the chin and has mesh front and back. The zip fastening at the front is covered for added protection. 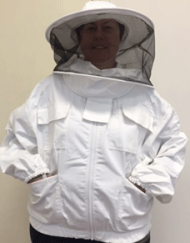 The Jacket has plenty of pockets on the arms and chest for storing your bee tools. 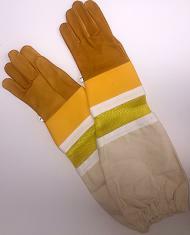 Add a pair of Leather Ventilated Beekeeping Gloves and you will be protected and ready for your bees. Arms are secured with firm elastic around the wrist. We have sizing from Small to 6XL. The jacket is machine washable although we recommend detaching the hat and handwashing it to protect the finer mesh material of the hat. 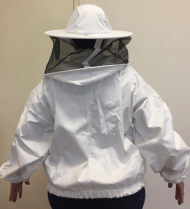 Our model is 160cm tall or 5 foot 3 inches and is comfortably wearing the Small Jacket.